Its been a while since the last ProdMod LED Camera Light update. I was going to review some brighter LEDs by comparing different brands and technologies. Like Hi-flux LEDs and 1W LEDs. I was also going to go over different ways to dim the LEDs like using a simple potentiometer instead of a resistor near the LEDs or in place of a resistor in the Voltage regulated Vpack. Then I was going to discuss how PWM dimming is better. Well instead of taking you through all those steps, I decided to just show you my latest development. It is a 1W led with PWM dimming control. So here are some videos that show how much light the ProdMod Camera Light can produce with only one 1W High Power LED running 350mA, and the second video shows the continuously variable dimming that the PWM control allows! The LED used for these tests is a SSC Seoul P4 (U-bin) SW0 Bare Emitter from DealExtreme. I’d love to sell you these myself, but they sell it for $5.80 free shipping. Not much I can do to beat that. I will include them in a future kit when its ready so you can get all the parts at once. If you compare it this video to previous videos of the 3LED and 4LED lights, you’ll see that this version doesn’t have dark spots in the corners. Remember this is just one LED, there is room for at least one more if you needed as long as your batteries can offer a total of 700mA. And here is the same light with PWM controlled dimming. So not only do you have a brighter camera light, you can also turn it on and off with the press of one button, and use that same button to dim the brightness while maintaining color correctness. Its also a bit easier on the eyes. The only downside I see is the 1000mAh AAA batteries might only last about 3 hrs, but its not tested yet. And by the way, the 1W leds get very hot and require a heat sink. Here is a video showing the current levels you can cycle through with PWM. From almost zero up to 0.38A. The power is coming from a DC boost circuit I bought online. It can provide more current with one AAA battery than the Vpack but is less efficient, and its PCB is .630in round making it harder to fit into the ProdMod LED case. You also have this PWM circuit which is also in a round shape at .860in diameter. Since the Vpack has the slimmest package I tested it with the 1W LED and PWM circuit and found it is only able to product a maximum of 220mA when powered with only one AAA battery. So you could try to fit the 1W LED, the PWM and the single AAA Vpack into your LED Camera light if you are ok with only getting 220mA to the LED. The 3.3V Vpack only got up to 150mA. Here is some simple video to show you how the Vpack powered PWM looks when filming the usual shower curtain. Remember this is 220mA. I then tried the same Vpack powered with two AAA batteries and now have plenty of current. In fact too much current at 100% PWM. So you’ll need a resistor to protect the LED. You can use the Vpack with or without the PWM control, but still need that resistor. Here is a video showing the current going above 570mA! So it looks like the 1W LED -Vpack combo may work after all. The challenge is now to fit all the parts in the battery holder. We know the Vpack can sort of fit inside one of the battery bays, but the PWM circuit is .860in diameter. And yeah, don’t forget about the heat sink. You could buy the emitter with an aluminum plate heat sink and then cut it to size. But that can be messy. I’d rather try to make my own heat sink to fit inside the case and still provide enough cooling to keep the LED from overheating. It’s also a good idea to subscribe so you don’t miss any updates. You can also receive updates via email as well. Sure, I’m interested, more in the technology than the application. My project is a gentle flash for single-shot camera to reduce shadows caused by electronic flash and to not annoy the subject. I’ve had this bookmarked as must do for a while… but I’ve been putting it off ’cause you just keep making it better. This latest rev looks pretty much like all I’d want. The only minor change is that I’d rather have a light level control that was an analog input rather than a button. Ideally a little thumb wheel. I’m not sure whether a separate power toggle would be better or just have it have one of the wheels with a stop on it so it can be an off switch (like the volume/off controls on old radios or walkmen). BTW is an Altoids can a sufficient heat sink? Aw man, Altoids? I know its the cool thing to do nowadays (see mintyboost) but don’t you like the nice sleek black battery holder as a housing? Oh well. I guess you could use the Altoids can for a heat sink, but I am honestly not sure its enough. The heat sinks that generally come with these 1W leds are at least 1/8″ thick (dont quote me). So I would make or buy a heat sink that about that thick. Altoids can is too thin. Can you solder to the Altoids can? If so you can solder the heat pad of the LED to the can and let me know. But you’d need to measure temperature to be sure. Also, if you don’t need a slim case, you can try buying the LED with the heatsink. It’s somewhere around 1inch diameter. You might see them in high power flashlights. As for dimming. I tried using the volume control knob as you mentioned, but it didn’t work well, not sure why yet. But if you wanted simple analog control you can use a potentiometer – it worked for me. If you put it between the battery and the LED you will be altering the current and brightness. I prefer PWM because it maintains the white color where a simple potentiometer can cause the white to get a bit blue Yelllow as it dims. It depends on what you are using it for I guess. You can also tie the potentiometer to one of the resistors on the Vpack regulator. This is more efficient than a simple battery potentiometer combo. Tell me more about what you are using the light for and whether you want to use the Vpack or straight battery hook up. Maybe we can work out the final solution online? I have a wee camera that I want to use this with, so a small case is better. I only suggested the altoids ’cause they have a smaller version (for gum or something) and if that is up to the heat dissipation, then yay. But it sounds like it’s not. I do not want to do an actual pot for the dimming… I was curious if it were possible to drive the PWM off some analog input device rather than (I assume) holding down the power button until the light level is right. Right now, I haven’t built anything (which is good, ’cause your design keeps getting better!). But I would prefer to use a Vpack, 1W LED and PWM. I would also like to have the thing as small as possible… so if I can get away with 2 batteries and a smaller case that would be a win, but w. the 1W led that may be too extreme. Anyway, I’d greatly appreciate a rough circuit diagram for your latest, and some pics of the innards! I think I read somewhere that you can use a pot to control the PWM, but I’d have to find the link. I also just realized the Vpack might not be able to manage the 300mA required by the 1W but I did find another DC boost circuit that will with only ONE battery. I’ll post soon. Ben Bennett: What do you mean by a “wee camera?” My project tangent is for Minox subminiature cameras: One inch by half inch by a few inches. Is that “wee” enough? I’m more interested in small size than bright light. I’ve acquired a small supply of FAN5607 ICs and related components, but these are surface-mount components — very tiny, very difficult to assemble manually (help!). So, I’m starting with a proof-of-concept device using the Vpack circuit board modified for 3-volt output driving 4 LEDs. awesome. I wanted to try the FAN5607 for a while now but havent picked any up yet. Let me know if you get it working. Some people can solder surface mount but its tricky. This site talks about using SMT boards. and sparkfun has this. Again its on a board with pads. Do you want to use a board or just freewire it? I would try to solder wires to the pads, and if you accidentally connect two pads together you can probably use a sharp knife or cutter to clip between them. Havent tried it myself. Just an idea. You might snap off the pads, too? Hey, where did you buy the FAN5607? I like these discussions, gotta open up a forum on the site. As for the Vpack, I used it with a 3xAAA battery holder and one battery. Works great, but I dont think it lasted too long. The Vpack cuts off at about 0.8V. I think I graphed this somewhere. Yeah about 3 hrs on a 3.3V Vpack. I just looked at the 5607 package. looks hard to solder since it only has pads but no “feet”. I found another chip FAN5609 and it comes in a 14-lead TSSOP, maybe its easier – but I dont see them in stock at digikey. Aaarggh! its for a 1W luxeon, but maybe you can use it with standard LEDs as well. This one from Zetex is simple but doesnt have input for PWM. I havent had time to read through all the specs. Let me know if you find a gem. kind of big though. about 2 x 2 x 1 inch. For controlling PWM with a potentiometer: Check this out. see page 3 – LED dimming control. This is an evaluation kit, but there must be a way to use this technique on your own. something a little easier to manage, but try to get the frequency up above 10 or 50khz. Ben by the way, dont wait to build stuff. If this design goes well its always going to improve in some way. If you keep waiting you’ll never be done . Its like waiting for something to go on sale, then when it does something better comes out and you wait again. You should start building something. This way we can all work in parralel. You build, I build, John builds the whole world builds, and we’d probably reach our goals faster and laarn more. plus help eachother along the way! Here is a simple PWM that uses a 555 and a potentiometer to vary the pulse width. This is where you can place a knob and control brightness through PWM. In case you are monitoring the comments, I have added a few new videos to this post. I am trying to find the best combination of dc boost and PWM circuit before I post the solution. The PWM I used in those photos is the D2DIM from taskled.com. It has a PCB diameter of 0.860″ so its hard to squeeze in. You can also make your own using a 555 timer and Vpack, but I am still finalizing the circuit. 1. Will you use the PWM to control 4 LEDs or one 1W led? 2. Do you want to control brightness with a knob, or momentary push button as in the videos? 3. Do you want to stick with a AAA battery holder or can you go up to AA size? 4. How many batteries would you like to use, 1,2 or 3? give me some feedback on what you need so I can better help everyone. Actually, I want to use it to speed control a motor that uses a 5V signal. In my situation, I am using a directional pad to control a motor but it only allows me one speed. If I could run the 5V to the directional pad through a PWM, I could, in essence, speed control the motor. So a knob would be ideal to control the speed. After my current DIY projects, I would eventually like to attempt building a LED video light, preferrably like the Litepanels Micro. If you have any ideas, please share! For the litepanels, yes I am heading in that direction. We will review PWM control so that you can set up your own array of LEDs. Personally I am going to try the 1W LED approach because I think the litepanels are too big for the common photographer to carry around. I just finished making a heat sink that fits in the AAA holder. Sorry I dont have pics up yet. If you are interested in a large array of LEDs in series I can try to cover that. You’ll need a DC boost at high voltage. And a PWM that can take it. The PWM circuit I purchased for the 1W only goes up to 16Vdc input, but you can make your own. Or better yet drive the high volt DC boost with a low voltage PWM signal using the EN pin. Here’s a silly question, do all PWMs need a heat sink? Why are heat sinks required? I thought PWMs are more efficient so there is less energy wasted, which should mean, less heat generated, no? The Litepanels uses only 4 AA batteries, which is 6V. Do you think they used a DC boost? Could you boost 6V as high as 40V or 60V? I found another PWM schematic that lets you adjust the frequency as well as the pulse width with 2 pots. What do you think about it and how does it compare to the dprg.org version? Do you think the 144Hz freq of the dprg.org version is fast enough to keep the motor from jerking on and off from the pulse width? sorry if it wasnt clear. The heat sink is only for the 1W LED. It produces a lot of light in a small package and draws 350mA so you need to dissipate the heat. PWMs do reduce the energy needed, but I guess at around 1000Hz which is the frequency of the PWM board I bought, its fast enough not to make a huge difference. Maybe 144hz generates less heat, but with Lighting you would see it flicker and it gets annoying. For the litepanels, yes a DC boost can go from 6V input to 60V output, what you trade-off is current. Overal you should have the same power (watts) in as you do out. 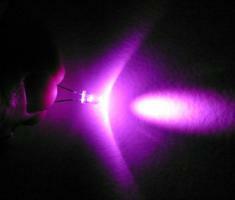 This is why it works well for LEDs. You take 6V and say 1A and have 6×1=6Watts in, and you can get 60V out but only 0.1A output. 6Watts / 60V = 0.1A. This assumes 100% efficiency which in never true. Anyway 100mA is plenty. Theoretically you can have 5 parralel sets of 18 sereis LEDs. 60V/3.3V = 18 LEDs. And 100mA/20mA = 5 parrallel rows. Total LEDs = 18×5= 90. I wrote this in 2 minutes so I hope I am right. If dprg.org used 144hz then it should be good for most DC motors. They are robotics guys. If you did need to change the frequency you would change the resistors, there should be an equation on that page. I’ll look at the new link when I have some time. I think you should just pick one and try it. Start with the dprg circuit since its taylored for motors. Have you bought anything else from them? I have purchased circuits from them. Every product is placed in a small envelope with minimal padding. one time I receive a PCB that was broken. But I wrote back to them and they sent me a new one free of charge. I can probably still fix the old one anyway. Response time to my email was a few days, but they did the right thing. I think its good service for the price. But I am not in love with their circuits. They are usually not efficient and tend to overheat, but they work nonetheless, and are dirt cheap. I would still buy from them in the future. Just want to drop a note that I’m still kickin’ (I’m old and slow . Assembled a 4-LED proof-of-concept prototype with one 4LR44 6-volt battery (1/2 AA size) push-button operated, no resistor – just series and parallel wired, giving 3-volts to each LED. Works fine, but remember, my project is for just enough light as fill-flash for Minox camera. I tried too many ways to wire the FAN5607 and gave up. Perhaps later. Have the Vpack but thought: Try the KISS formula (keep it simple stupid) and that’s when I built the prototype. I’m now assembling the 2nd prototype using 6 LEDs but a little more elegant. Intend to use it for experiments with my Minox camera. Again, my priority is tiny with just enough light. These two prototypes are about 26 x 37 x 30 mm (.6 x 1.5 x 1.2 inch). I have a bunch of FAN5607 chips if anyone wants to experiment. Promise to post feedback and I’ll happily mail you one. Click on my name to go to my web site to get my email address. Nice little project, and I appreciate the improvements you’ve made. I also have an interest in a larger version along the lines of the Lightpanel product. Any plans on doing one soon? 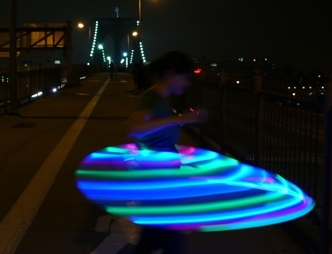 I’d like to but lately I am bogged down fulfilling order for the LED Hula Hoop Kit for Make Magazine. They are carrying two of my kits on their site and I will be presenting at the Maker Faire May 3rd and 4th. Come check it out if you are in the SF bay area. When I do finally get back to the Camera Light project I think I will first finish this 1W LED concept and then quickly move onto a Ring Light since it seems more in demand. I don’t think the LED LitePanel is hard to do. If you want I can try to give you some ideas and you can go ahead and make it. Then we’ll post it here on ProdMod. Ring light is interesting idea also, but coming up with appropriate ring that fits correctly over your camera lens will be the trick. Hmm….the greymatter has started to consider that ring…. Chuck, you are talking about this one right? I think you can put the LEDs so that they are drilled through the door of the battery holder, or sitting on top of the battery door in a matrix of LEDs. Or don’t bother trying to use the battery holder box. maybe make one custom or use a project box from Radio Shack etc. That’s the one. I’ve seen it in person and it puts out an amazing amount of light. The 1.5 hour usage figure is supposedly at full power setting also. With a bit of difussion added it would make a great fill. I thought about the battery door idea, but since it slides to open what do you do with the wiring? Also, is there enough clearence between the sides of the batteries and the led contacts? Seems unlikely. Oh, on the ring light…. I realized this wouldn’t work with my camera as there is a sensor near the lens shaft that would be covered. What kind of camera do you have? are you sure its a sensor? Most newer digicams focus digitally through the lens. The sensor near your lens might actually be a red LED to assist in auto focusing, You wouldn’t need that with an ring light. Video camera as opposed to still. Yes it is a focusing sensor….without which it would not be able to focus. No easy manual control of focus. Not my choice of camera but it’s what I have to work with right now. These guys also have some miniature pots that might work. Those LEDs are very bright at 10,000mcd but are most likely very focused, 15-20deg viewing angle. So you might get a spot light effect, but I am not positive of it. then you can search for LEDs that have good brightness but also 35 deg angle for example. The mini pots are very useful. Not sure if I got it from goldmine but I found one that fit perfectly in the camera light kit case. Remember you wont keep consistant color with just a pot dimmer. You’ll need PWM for that. folks I’ve read stuff from. Thank you for posting when you have the opportunity, Guess I’ll just book mark this web site. that is being covered so that the right amount of paper can be ordered for the job. they have seen and done a lot. Whatever you do the G Shock are tough and will stay with you no matter what kind of sports activities you do. Get familiar with the services, strategy designed by the SEO experts. a number of avid gamers, with bits referred to as tiles. is a really neatly written article. I’ll make sure to bookmark it and return to learn more of your helpful info.